Gibson & Camp At The Gate Of Horn is the folk classic that is often said to have bridged the gap between the music of The Weavers in the 40s and 50s and the singer/songwriter music of the mid to late 60s and 70s. It is considered one of the most influential folk albums of all time. 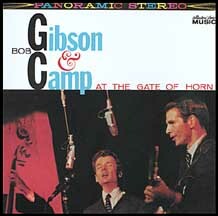 "Gibson & Camp's At the Gate of Horn was one of the most influential folk albums of the early 1960s, striking a chord with many young musicians with its dual harmonies, verve, and irreverent humor. While it might sound tame to some ears forty years later, it should be borne in mind that the early-'60s folk revival often suffered from an overly stiff and serious approach. Gibson & Camp helped demonstrate that it was possible to have fun playing folk music, and, not coincidentally, to be popular and sell some records without selling out." "Gibson & Camp were a hit together, attracting standing ovations at their home grounds of the Gate of Horn, and also making a splash at the Newport Folk Festival. In April 1961, Elektra recorded some of their live act, complete with joking between-song banter, for At the Gate of Horn over the course of three sets, believes Camp. The eleven songs (thirteen if you count all three components of the "Civil War Trilogy") were for the most part traditional numbers given new words and musical arrangements by Gibson and Camp. Sometimes these were devised in partnership with each other, sometimes by Gibson alone, and on "First Battalion" by Camp and humorist/songwriter/cartoonist/author Shel Silverstein, who also wrote the liner notes." The recording of Betty And Dupree appears on the Rhino Records 3 CD boxed set Washington Square Memoirs R74264 (2001). A live recording of Skillet Good and Greasy appears on the Hootenanny Vol 2 LP (1963), Crestview/Elektra CRS-7807. "Old Blue" and "Wayfaring Stranger" are on the 2014 2 disc set, Constant Sorrow - Gems from the Elektra Vaults, available at Amazon.